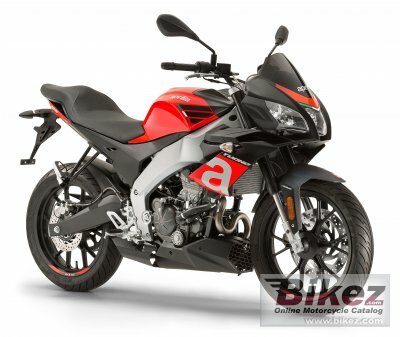 2018 Aprilia Tuono 125. Picture credits - Aprilia. Submit more pictures. The Tuono 125�s chassis is a work of art inspired by speed and total control of performance. Made entirely in aluminium, it is an exclusive in the 125 segment of the little devil; made in Noale. Designed on the basis of Aprilia�s experience on the track, the spectacular perimeter frame consists of die cast aluminium spars with crossed reinforcement ribs. The result is a lightweight structure, capable of providing high torsional rigidity in order to guarantee top performance. Ask questions Join the 18 Aprilia Tuono 125 discussion group or the general Aprilia discussion group. Bikez has discussion forums for every bike. View comments, questions and answers at the 2018 Aprilia Tuono 125 discussion group. You can sign up for e-mail notifications when other riders answer you. If you have extensive experience with the MC, please send us a review. If you consider buying this bike, you should view the list of related motorbikes Look at photos. Compare technical specs. And check out the rating of the bike's engine performance, reliability, repair costs, etc. You can compare the rating with other bikes.